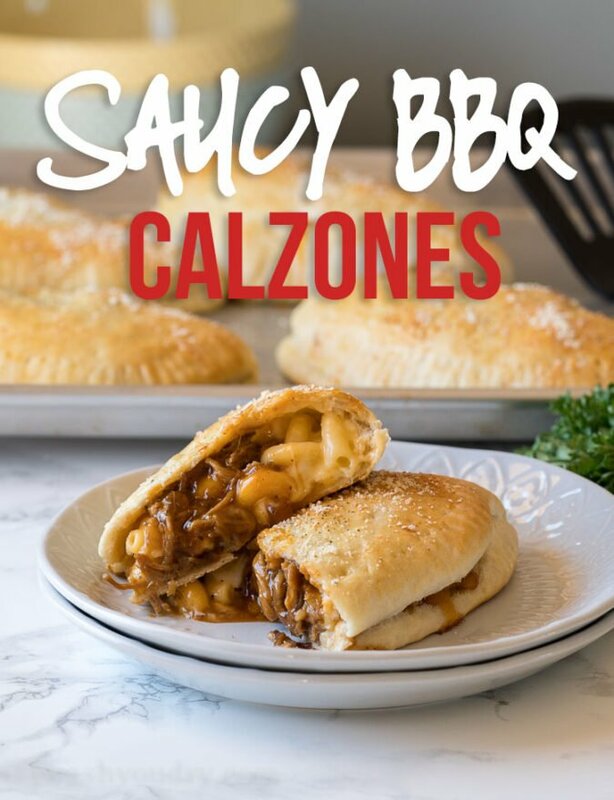 These Cheesy BBQ Pork Calzones are stuffed with extra cheesy macaroni and cheese, saucy shredded pork and baked until golden brown. Who says calzones have to be stuffed with marinara sauce and pepperoni? Not me! 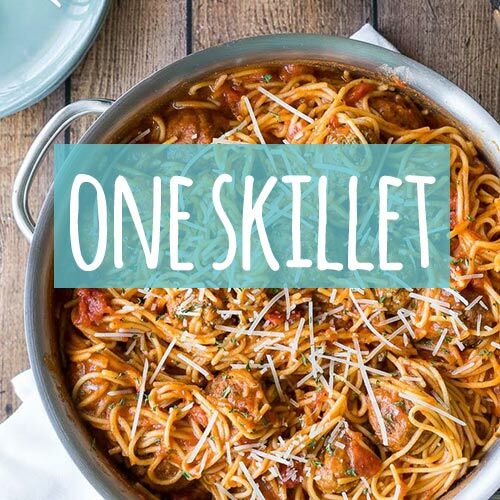 I’ve teamed up with Bob Evans Grocery to share this super easy and totally fun twist to your pizza night! 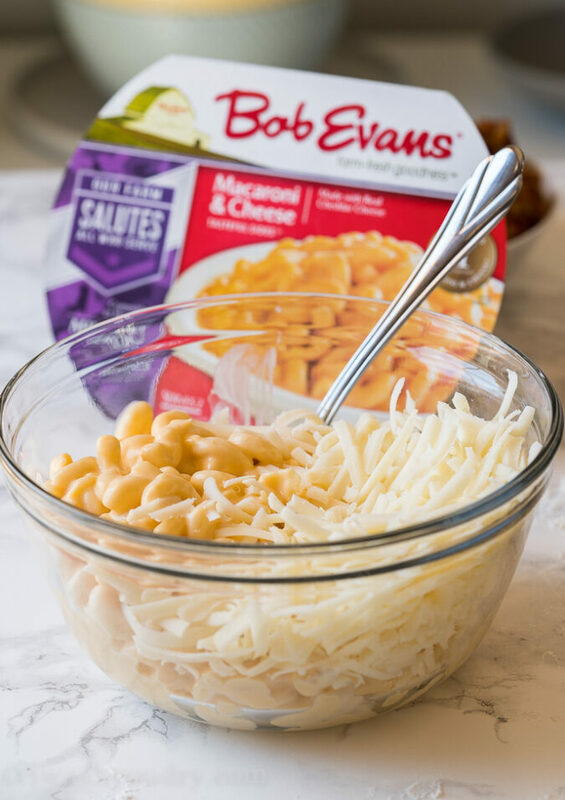 Grab a package of Bob Evans Macaroni and Cheese and let’s get started! Start by mixing up a super simple pizza dough. I’m giving instructions on how to make your own pizza dough down in the recipe below, but if you’re in a time crunch, using pre-made pizza dough will work great! Divide the dough into 8 balls and then press each ball of dough into a small circle about the size of your hand. It’s important to make sure that your dough is not pressed out too thin, or you’ll end up with cracks and leaks in your calzone. Don’t over-fill your calzone or you might run into an issue when you try to seal it up. Place the filling slightly off-center so you can easily lift up the dough and cover without tearing the dough. Leave at least 1/2 inch seam around the filling to the edge of the pizza dough so you can crimp the edges closed. For the filling of my Cheesy BBQ Pork Calzones I went with a container of Bob Evans Original Macaroni and Cheese and combined it with some shredded mozzarella cheese. 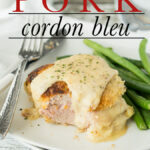 This ultra cheesy filling is the same filling that goes into my Macaroni Stuffed Meatloaf. 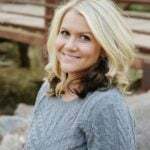 It’s a winner, so I knew this would be a winner too! 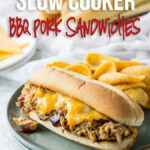 I added in some saucy bbq pulled pork, which I have a great recipe for, but you can also use store bought pre-made pulled pork too. 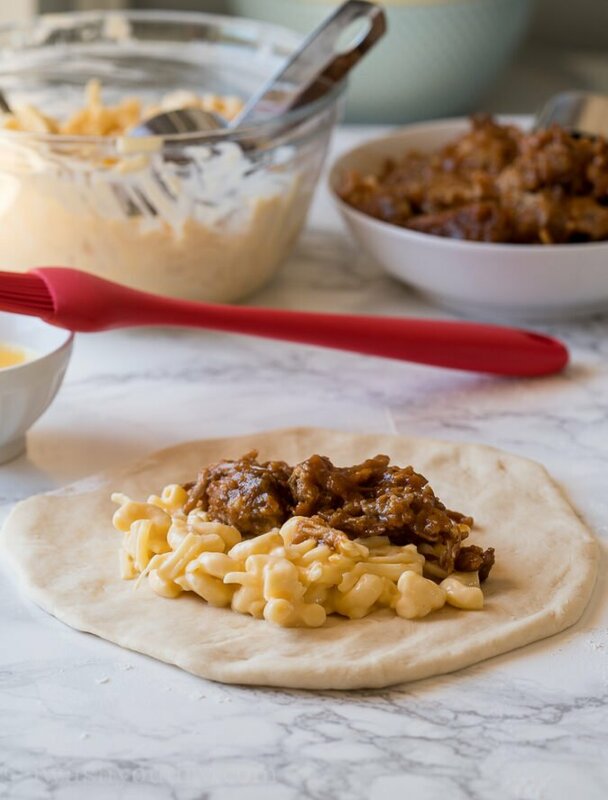 These delicious Cheesy BBQ Pork Calzones can come together in just a few minutes! 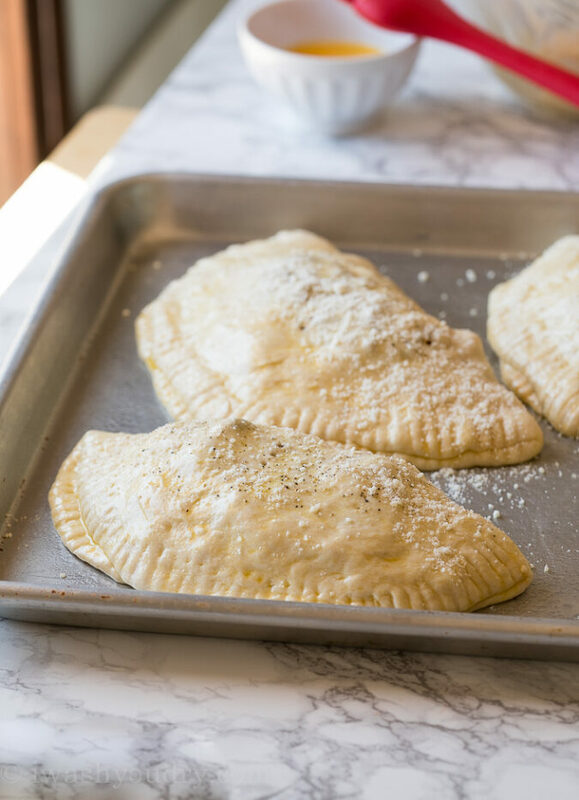 Brush the tops of each calzone with a simple egg wash and then sprinkle with crushed black pepper and grated parmesan cheese. Make sure to poke a few holes in the tops of each calzone with a fork so it has room to vent any steam that might want to escape. Are These Calzones Freezer Friendly? This recipe makes 8 large sized calzones, which was more than my family could eat in one sitting, so I froze the rest for later. I baked all 8 calzones, let them cool then wrapped them individually in foil and placed them in a plastic zip-close bag. When you’re ready to eat, just preheat the oven to 350 degrees F and bake until heated through. My family LOVED these super easy and saucy calzones, and I’m sure you will too! 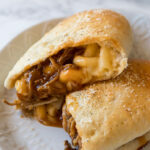 These Cheesy BBQ Pork Calzones are filled with macaroni and cheese, saucy bbq pork and then baked until golden brown. 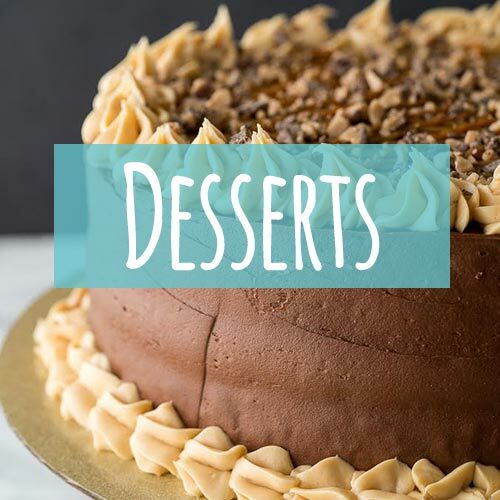 Combine 2 cup of flour, yeast, sugar and salt in a large mixing bowl and whisk to combine. Stir in the warm water and oil until mixture is thick and sticky, about 1 minute. Add another 1 cup flour to the bowl and mix with a sturdy spoon until mixture comes together, then transfer to a flour-dusted surface. Knead until dough is smooth and elastic, adding extra flour as needed. Divide dough into 8 balls and press into circles about 6 inches in diameter, making sure the dough does not become too thin. 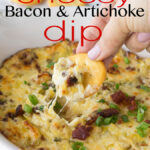 Meanwhile mix together the macaroni and cheese with the shredded mozzarella cheese in a small bowl. 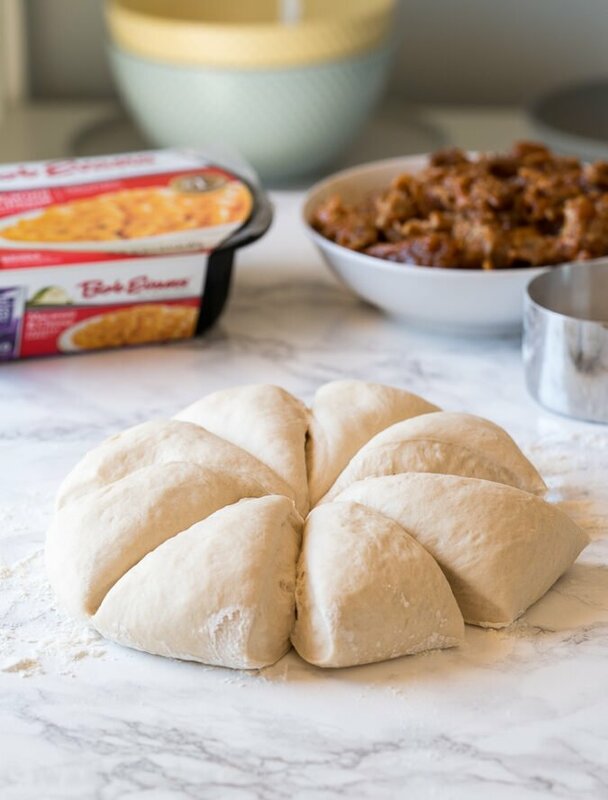 Divide the macaroni and cheese mixture among the centers of the calzone, leaving at least a 1 inch border around the circle. 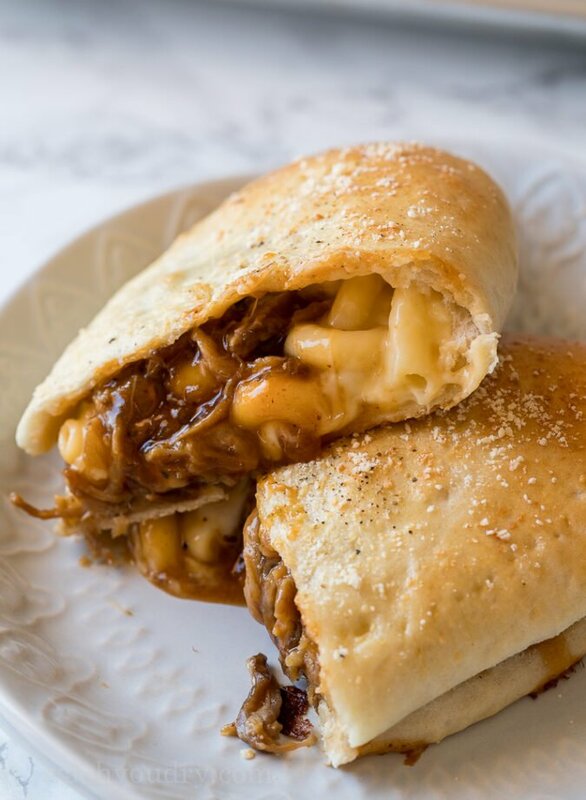 Divide the bbq pulled pork among the calzones on top of the macaroni and cheese. Lightly beat the egg with 1 tsp water in a small dish and lightly brush the outer edges of the calzone to help create a seal. Fold the calzone over, creating a pocket for the filling and use a fork to crimp closed. Poke the tops of the calzones with the fork a few times to create air holes in the filling. Brush the tops with the egg wash and sprinkle with a little bit of grated parmesan cheese and black pepper. 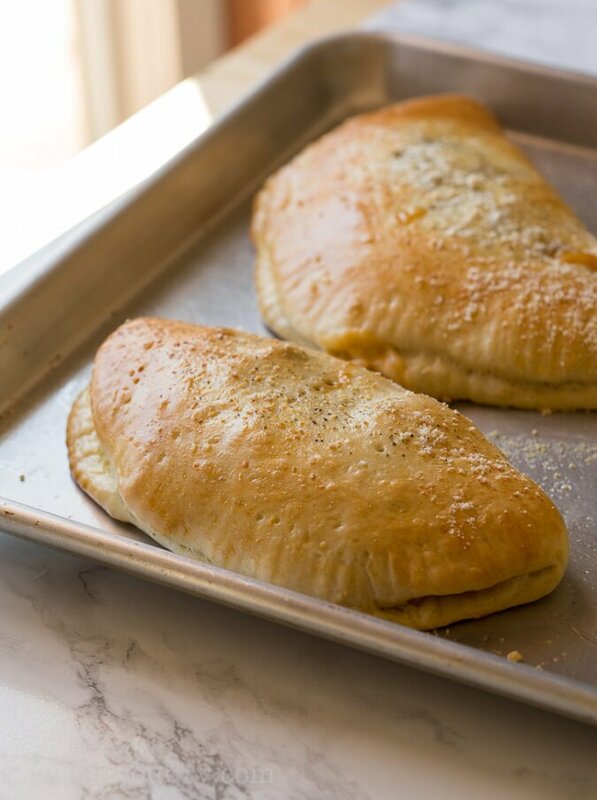 Place calzones on a lightly greased baking sheet and bake for 13 to 15 minutes, until calzones are golden brown. Let cool for a few minutes before enjoying. Macaroni and Cheese and bbq pulled pork do not need to be preheated. Disclaimer: This post is sponsored by Bob Evans Grocery. All thoughts and opinions are 100% my own. Thank you for supporting the brands that help make I Wash You Dry possible. If you use store-bought pizza dough, how much do you need to buy? I would get enough to make at least two pizzas.